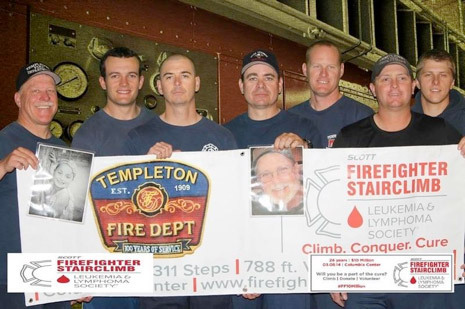 On March 8, seven members of the Templeton Community Service District Fire Department participated in the Leukemia & Lymphoma Society Firefighter Stair-Climb in Seattle, WA at the Columbia Center. The Templeton CSD Fire Department Stair-Climb Team raised $9,365 in donations for the Leukemia & Lymphoma Society. The Department will continue to accept donations until April 15, 2015. Please contact bwall@templetoncsd.org if you would like to make a donation. Captain Brandon Wall after finishing the climb. Captain Kurt Pennington, Firefighter Haustin Morrison, Engineer Jeff Tomlinson, Engineer Phillip Goldbloom, Firefighter Jeff Cannon, Captain Brandon Wall and Firefighter Craig Pennington participated in the climb. The climb was done in full structural firefighting gear: boots, pants, coat, helmet and gloves while wearing and using self-contained breathing apparatus every step of the course weighing nearly 60 pounds. The first firefighter of 2,000 entered the stairwell at 8:00 a.m., the rest followed at 12-second intervals. The average time of the Templeton Firefighter participants was 25 minutes to finish the 69 floor (1,300 step) climb. Each firefighter covered their own out of pocket expenses including their flights, hotel and registration fees. Captain Kurt Pennington preparing for the climb. 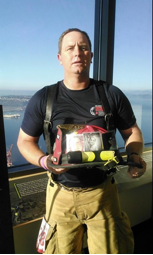 Firefighters climbing 69 flights to the top floor in honor or in memory of someone, carried pictures on their helmets, and posters were placed in the stairwell of the person they were honoring or remembering affected by leukemia & lymphoma. “I cannot express the pride and admiration I have for our staff and all of the firefighter participants; giving back for a great cause. Templeton is extremely lucky to have the firefighters of this quality and integrity,” stated Interim Fire Chief Keith Aggson. Since 1949, The Leukemia & Lymphoma Society (LLS) has been dedicated to curing leukemia, lymphoma and myeloma. LLS is the world’s largest voluntary (nonprofit) health organization dedicated to funding blood cancer research and providing education and patient services. For more information go to lls.org.